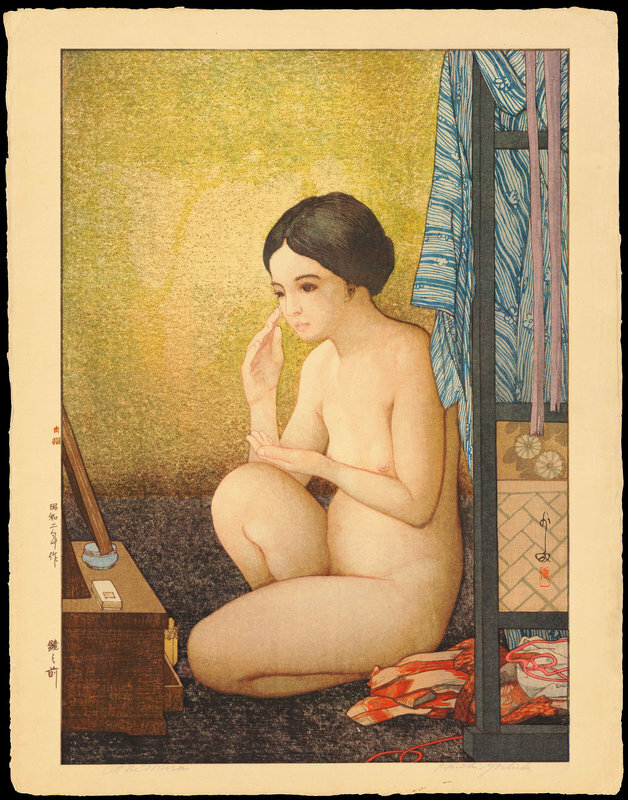 Yoshida, Hiroshi (1876-1950) "At the Mirror" - Woodblock - Chinese and Japanese woodblock prints for sale, silkscreen, scrolls, watercolor, lithographs. Artwork Details for Yoshida, Hiroshi (1876-1950) "At the Mirror"
Condition: Apart from some light creasing and nicks in the margin edges the print is near fine. Mild paper mellowing commensurate with the age of this print. The paper is supple. There is one light crease in the left margin that extends slightly into the image area, but it appears to be original to the paper because it has been smoothed over by the baren. The verso is clean. Notes: Early edition with the all-important jizuri (self printed) seal in left margin, followed by the date, and then print title. Signed in sumi ink, Yoshida, with artist's seal Hiroshi, in the image area at lower right. Sheet size is 44.1 x 56.5cm. This is a very rare and sought-after scene by Hiroshi. Beautiful double oban size (rare in itself for Hiroshi). A young woman pensively applies makeup before a mirror. One of a very few nudes by this artist.